The left is forever being condemned for talking of ‘betrayal’. But it is our responsibility to describe accurately the lies and strategy that lie behind the dismemberment of the NHS and the blatant disregard of the people’s wishes – it is a ‘double betrayal’. 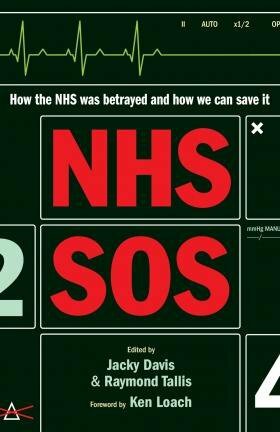 “This book is about the betrayal of the NHS – and of the people who depend on it for health and health care – by politicians, journalists, the unions and, perhaps most culpably, the leaders of the medical profession. Without the active collusion, passive acquiescence or incompetence of all of these players it would hardly have been possible for the Tories – who did not command a majority in Parliament – to have succeeded in getting Andrew Lansley’s nightmare vision for the NHS enshrined in law”. There can be no doubt that Cameron and his party were very well aware that the people regarded the NHS with its principles of egalitarian solidarity as the most treasured institution in Britain. Thus Cameron went to great lengths to reassure the public that the NHS was safe in his hands. The Tories would protect the NHS from cuts in its budget and “stop the top-down reorganisations that have got in the way of patient care”. This pledge was reaffirmed by Cameron and Clegg in the coalition agreement. Meanwhile Lansley, who had been instructed to keep mum about his plans before the election (see Nicholas Timmins’ account in Never Again), began to unveil his stark privatising drive under cover of removing bureaucracy from the NHS and putting general practitioners in charge. The rest is history – real-life “horrible history”, set out in detail in NHS SOS, of continuing destruction of the health service, political chicanery, corruption, the collusion of the Department of Health with the private sector, the meekness of medicine’s professional bodies – especially the BMA, the indifference and neglect of the media, the weakness of the Labour party’s response and worst of all the failure of leading Lib Dems (Shirley Williams as well as Clegg) simply TO STOP LANSLEY. Our state, political class, Parliament and major civil society institutions are revealed as rotten to the core. There are few heroes – Dr Clare Gerada at the Royal College of General Practitioners, Channel Four News and the Guardian, several of NHS SOS’s authors and Lord (David) Owen among them. “Many people”, write Jacky Davis and Tallis, in the sections on saving the NHS, “have woken up to the dangers of the act and want to campaign”. I would like to share their confidence. I fear that the great majority of people are maybe uneasy but essentially unaware of the gradual dismemberment of the service; that they are reassured by the continuing commitment to a NHS “free at the point of need”, compromised as it is; and are being distracted and softened up by the government’s exploitation of scandals and failures. Yet if there is an audience that will join in campaigning at local and national level, in the ways that Davis and Tallis suggest, then surely it is on OurNHS? So go to it – and embrace David Owen and his bill to reinstate the Health Secretary’s duty to provide a comprehensive and integrated National Health Service.